Kel didn’t plant cantaloupe this year. And yet we have a veritable army of volunteer plants and a steady stream of melons. Along with its real estate-hogging pals watermelon, zucchini, acorn squash, and butternut squash – also volunteers – it’s taking over the garden with umbrella-sized leaves and grasping tendrils. (One of the unsung benefits of composting – “free” vegetables the next season!) Cantaloupe is the quintessential summer fruit with its sweet juice and delicate flavor. These refreshing mini-smoothies come together in just a couple of minutes, keeping you out of the kitchen and in the garden – wrestling with the volunteers. Cool and creamy sips of summertime! 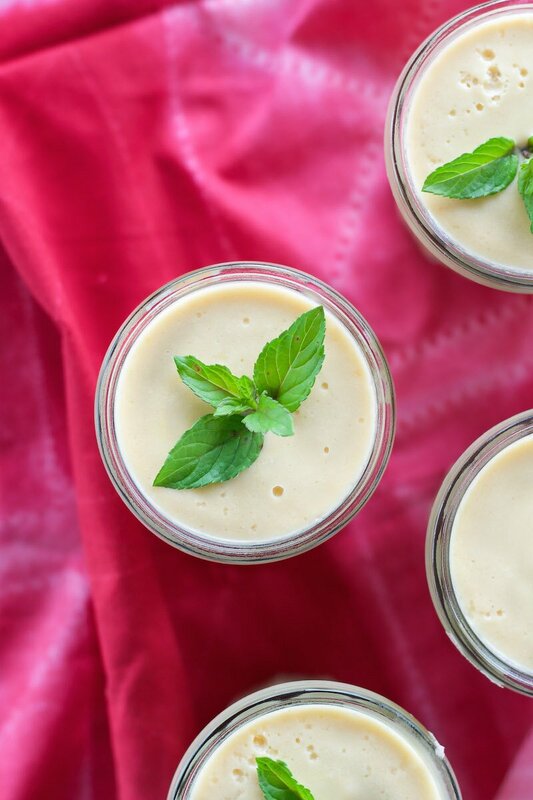 Drink your fruit in the form of these delicious cantaloupe cream “shooters. Dairy-, gluten-, and sugar-free. Put all of the ingredients into a high-speed or regular blender and process until silky smooth. Garnish with mint leaves. Enjoy right away or let chill for a few hours to firm up slightly. We’re terribly lazy. We have little tomato plants everywhere, basil, potatoes – – it’s free-range around here! This is so unique and looks delicious! Looks SO refreshing!! I love puree cantaloupe and feel like it never gets the smoothie love it deserves! Cant wait to try this one! Yum, these shooters are the most elegant I have seen in a long time! cantaloupe, banana lovely combo and refreshing drink..